I am so excited about my new site and new brand. Let me show you around. This is what the home page looks like. You can always click on the logo to bring you back home. 1. I actually have a logo now. A real deal logo! Pretty great, right?! Becca at Skwintz worked her magic on the design. I love how fresh and clean it is. 2. Up in the top rightÂ are the navigation tabs. 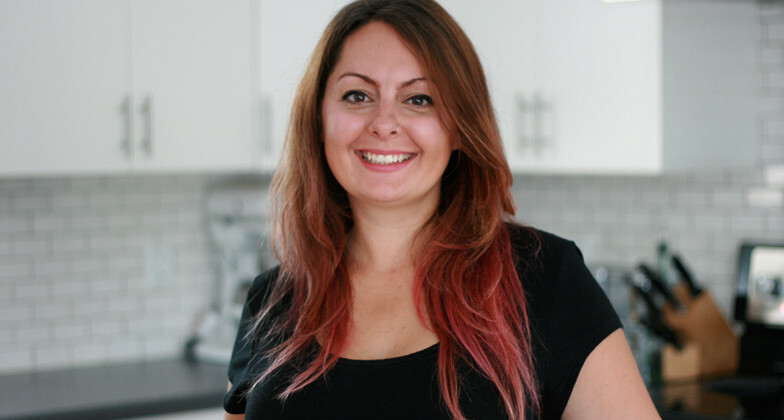 Need a recipe check out the Recipe Index, want to know more about me check the About, have a burning desire to contact me Contact is where you go. These will be visible on every page you visit so you can click them where ever you are. 3. 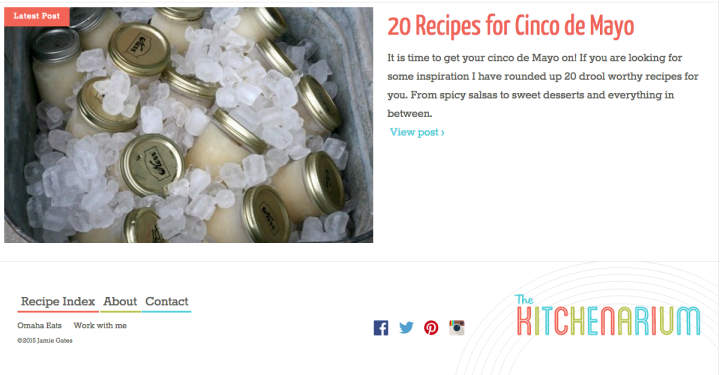 The latest (and greatest) recipe will always appear on the home page. You will get to see a photo and a little excerpt from the post or about the recipe. 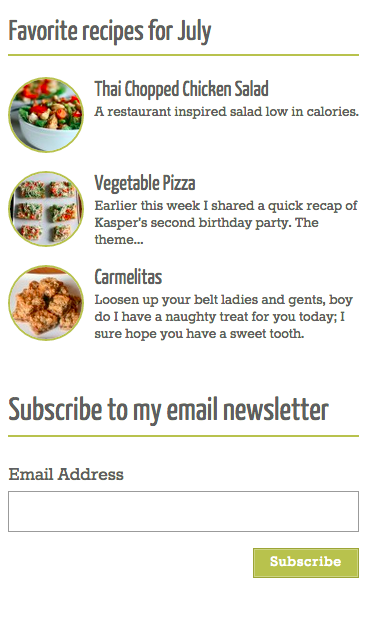 Directly below that you will see the most recent six recipes. 1. At the bottom is where the latest post will show up. Posts are different from recipes. Posts may include recipe round-ups, tidbits about my life and family, gardening, and basically anything I think is interesting and feel like sharing with you. Let’s see what happens! 2. Another repeat of the top navigation but also including Omaha Eats (restaurant recommendations in Omaha) and Work with me, where I share where I have been published and how I would like to work with you. 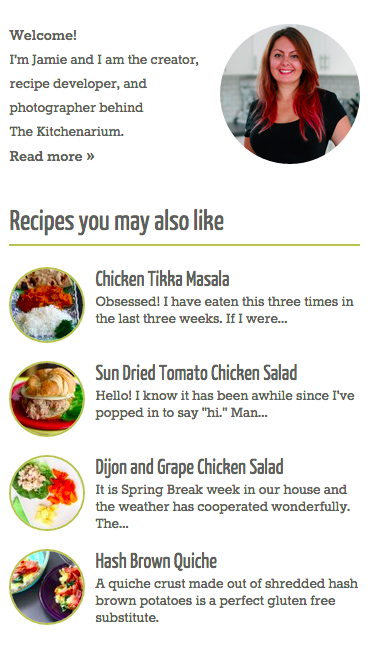 Once you visit the Recipe Index page you can search your little heart out. Currently you can search by category and ingredients but cook time and serving size are coming soon! Also can view all recipes for specific special diets. Yay! 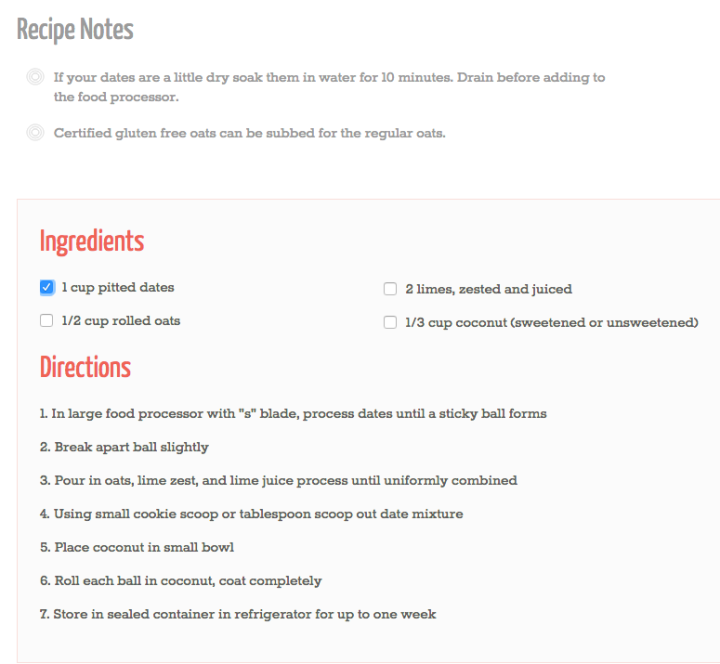 Once you are reading a recipe post you will notice I have included a handy dandy box that tells you immediately the prep time, cook time (if applicable), and the yield. 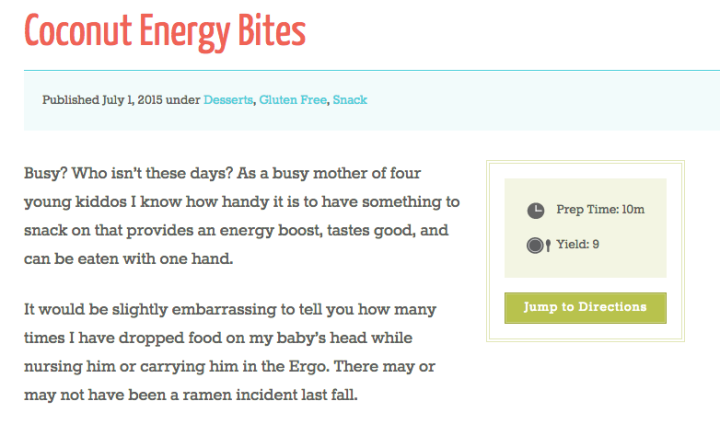 You can also click “jump to directions” to skip down to the recipe. Since I understand not every one has the time to read all the hilarious or super informative material I have written I decided to add a “Recipe Notes” section. In this section you can find important info about the recipe that may have been mentioned up above or something that is good to know before you start the recipe. One of my favorite features is the ability to check off the ingredients as you go along. I can’t tell you how many times I have been distracted in the kitchen and can’t recall if I actually added an ingredient. Checking them off while you add them will help with that. You can now PRINT! You can also search for other recipes containing similar ingredients. 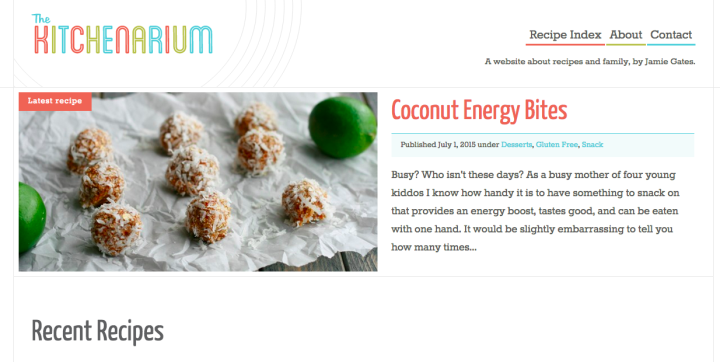 Want another coconut recipe just click coconut. The print page is super simple too. I opted to not include photographs and the other post text and have you print just the recipe instead thus saving paper and ink. Side bar time! This is where I welcome you, so, welcome! 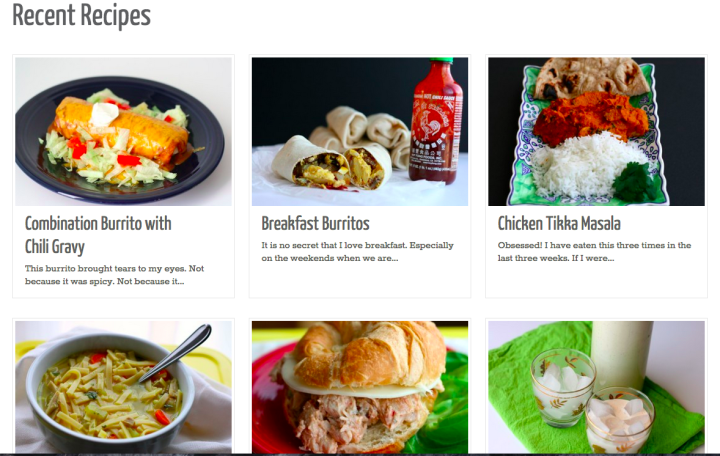 I will also show you other recipes that you may also like that are in a similar category as the main recipe. 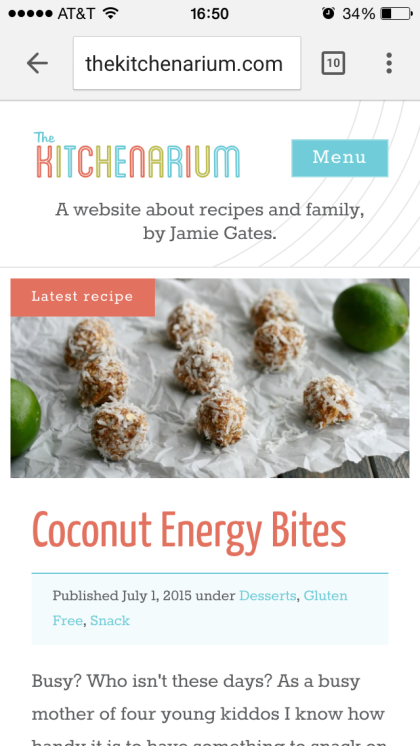 Scroll down a little further and you will see some of my favorite recipes for the current month and it where you can also subscribe to my email newsletter. Since we are all on-the-go type people this site is mobile responsive. Not sure what responsive means? 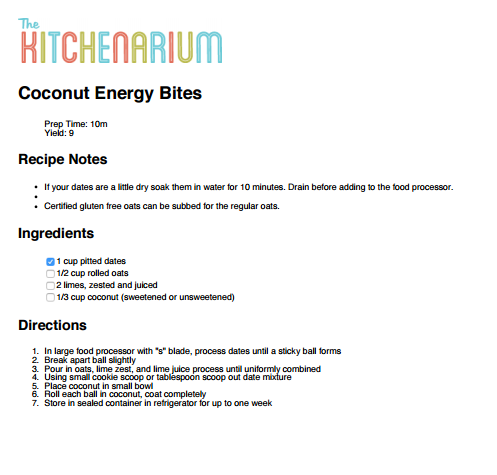 In a nutshell, it will look good on your phone or tablet so take The Kitchenarium on the go with you. Yay! A BIG HUGE GIANT thank you to my husband Alex and our friend Christopher Kollars for doing all the programing stuff needed to make this site work. They are some pretty great dudes! And an ENORMOUS thank you to YOU for coming here, reading, and cooking. I love what I do and couldn’t do it with out you. XOXO!